... of how you dispose of equipment! A ship's distress signal has been traced to a mountain of scrapped fridges and TVs in Belfast. A team from broadcasting regulator Ofcom found the beacon after the mayday was picked up by Civil Aviation Authority Receivers on the Isle of Man. Normally a rescue helicopter is scrambled when a distress signal is picked up, but RAF Kinloss could tell the signal was on dry land. The beacon activated after it had been dismantled from a vessel. It was tracked by satellite from a scrap-metal yard in north Belfast last week as it was moved by lorry to one in Queen's Island in the docks area. 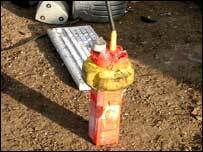 The beacon was found in the middle of a 20ft pile of old electrical equipment. Philip Morgan, Spectrum Manager for Ofcom Northern Ireland, said the device had to be found and turned off because it interferes with the CAA's radio system. "It was a bit like looking for a needle in a haystack, but using our radio tracking equipment, and with the help of the scrapyard's crane, we were able to find the beacon very quickly and disable it - within a couple of hours of it going off." Ofcom Northern Ireland investigates about half a dozen cases every year of distress beacons from ships or planes being activated accidentally. Mr Morgan said the devices, which can go on for a considerable length of time, had to be disposed of responsibly. "Otherwise they can cause a false-alarm which wastes the rescue services' time and could divert them from a genuine emergency," he said. Ofcom is responsible for monitoring all radio broadcasts and for investigating cases of interference. wow, what a terrific post. I've just now been writing about an EPIRB case here in New England and on on personal locater beacons, the outdoorsman's version of EPIRBs, for sea kayakers. What heartening news, to learn that an EPIRB will continue to transmit even when buried under 20 feet of scrap, and so long after a ship has been dismantled. I'm linking to your post today! The case I'm writing about ended, sadly, in tragedy: two young commercial fishermen in their twenties perished.